The Republic of Ireland beat Austria for the first time since 1963 to move top of Group D, boosting their chances of qualifying for the 2018 World Cup. 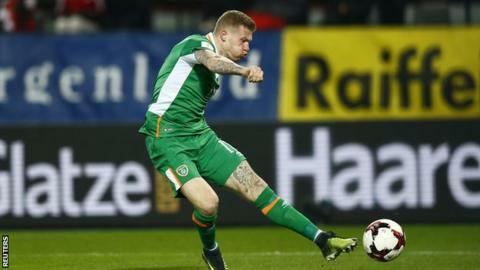 James McClean struck soon after the break with a super goal from an acute angle to surprise an Austrian team which had dominated the opening 45 minutes. The victory, the Republic's first over Austria in nine matches, leaves Martin O'Neill's men with 10 points. Early pace-setters Serbia drew 1-1 with Wales later on Saturday, meaning they are now two points behind the Republic, with Wales a further two points back. Manager Martin O'Neill said before the match his team would "go for it" against a country they had beaten only twice in 14 meetings, but they failed to make an impact in a soporific first half as they were reduced to containing an Austrian side which was dominating possession. The Republic had no shots on target in the first 45 minutes, unsurprising as they had only 35.4% of possession, and Jon Walters, leading the line on his own, had little to work with. The Stoke forward did waste a glorious chance, shooting over the crossbar when sliding through unchallenged six yards from goal in a rare chance for the visitors. But O'Neill's men were transformed after the break, bossing the hosts immediately. Austria's Kevin Wimmer lost possession near his own corner flag - the Tottenham player appealed hopefully for a foul - and the visitors counter-attacked with pace. Wes Hoolahan found McClean with a delicious pass, setting up the West Brom winger to shoot from left of goal and through the legs of Ramazan Ozcan. Walters thought he had doubled the lead minutes later, but his header was disallowed for offside. By then however O'Neill's men had done enough to record a historic win. Austria, many people's dark horses before the start of Euro 2016 after their impressive unbeaten qualifying campaign, have struggled to stop the rot which set in in France, when they went out in the group stages. They have now won only once in seven games and are six points adrift of a Republic side who are top after four of their 10 qualifying games. This graphic shows the average positions of the Republic's players. The majority of players, other than Jonathan Walters (19), Jeff Hendrick (13) and James McClean (11), spent the majority of the match in their own half. But their containment was a successful ploy. Their star players - Bayern Munich's David Alaba and Stoke's Marko Arnautovic - failed to inspire and the odds on Marcel Koller's side qualifying for their first World Cup since 1998 have lengthened. Austria had chances, their best coming just before the break when Marcel Sabitzer struck the crossbar after being put through by Arnautovic. But the player which summed up their disappointing 90 minutes was Marc Janko, who twice squandered chances to level. The striker should have at least tested Darren Randolph instead of heading wide and did the same in injury time in what was his team's last throw of the dice. Republic of Ireland boss Martin O'Neill: "Austria will naturally be disappointed because they have dropped all three points here, they drew at home with Wales and were beaten by Serbia. "Something tells me that they still have a chance and while I believe - and have always believed - this group will be tight, I think teams will still take points from each other. "I'm really pleased to have 10 points on the board from four matches. But there are a million miles to go." Austria manager Marcel Koller: "It is very difficult for us and they are big points for Ireland, who are well ahead of us now and will take a lot of self-confidence into the winter break. "But there are still six games and 18 points to play for. I know it will be difficult, but we will do everything we can to be successful. "We knew Ireland played a very defensive game and, after going in front, they became even more defensive. But if you do not score, then you do not win the game." Republic of Ireland have won three consecutive internationals for the first time since October 2015. Martin O'Neill's men are yet to lose in 2018 World Cup qualifying, winning three and drawing one of their four games to date. James McClean scored in consecutive games for the Republic for the first time since October 2014. Republic of Ireland scored with their first shot on target in the game. Wes Hoolahan has assisted in three of his last five internationals. Martin O'Neill's men host Wales in Dublin on 24 March, but will be without Robbie Brady who will be suspended for the match after receiving a yellow card in this match. Austria, meanwhile, play bottom-of-the-table Moldova on the same day. Read more on Cyrus Christie: Derby County defender to miss "at least three months"